HomeLineage Group II: Elisha Ballard of Nansemond County, Virginia (bef.1732-aft.1771). Elisha Ballard, the earliest (if scantily) documented member of this line, is commonly identified as the father of Elisha Lawrence Ballard of Isle of Wight County, Virginia. He is possibly the son of Joseph Ballard of Albemarle County, North Carolina (c.1652-1729). We know of him from two sources: the last will and testament of his father-in-law, John Lawrence recorded among the records of Isle of Wight County, Virginia, and the processioning records contained in The Vestry Book of the Upper Parish, Nansemond County, 1743-1793 (Wilmer L. Hall, ed. ) (Richmond: Library of Virginia, 1949). Since we know from other records that his son Elisha Lawrence Ballard was born about 1756 (and could not do this sort of work until about 1777 when he attained legal age), we are fairly confident that the one reference to an Elisha Ballard in Isle of Wight County wills is actually Elisha Lawrence Ballard, given that the latter record is an estate account of Henry Vaughan examined by Mills Lawrence and Elisha Ballard (Isle of Wight Co. Va. Will Book 10, p. 47); Elisha Lawrence Ballard served in this capacity — either appraising estates or examining accounts — with Mills Lawrence on seven other occasions. Elisha Lawrence Ballard was devised considerable property by his maternal grandfather, John Lawrence of Isle of Wight County, Virginia in his will of 2 March 1757. This bequest included the “home plantation” and two parcels of land in Southampton County, Virginia. The John Lawrence will names his grandson Elisha Lawrence Ballard (“land in Southampton County”), his nephew John Lawrence, his brother’s son (“land in Southampton County”), his granddaughters Honour Ballard and Ann Ballard, and his daughter Ann Ballard. His son-in-law Elisha Ballard is named executor. Recorded 5 January 1758, Isle of Wight Co. Va. Will Book 6, p. 313. Apart from John Lawrence’s will, we find no mention of Elisha Ballard among the records of Isle of Wight County for the period that we’ve examined (1720-1736; 1741-1782) which leads us to the conclusion that he most likely resided in Nansemond County, which has suffered catastrophic record losses. For information on him, we turn to the Upper Parish Vestry Book. The Vestry Book’s processioning records allow us to place individuals geographically within the county. The processioning records describe districts, which are then assigned to pairs of men to complete the processioning, which occurred every four years. A genealogist created a map in the 1970s that roughly showed the location of each district. The records excerpted below show that Elisha Ballard, an Abraham Ballard and a John Ballard were assigned to procession or are mentioned as landowners in Districts 6, 7, 8 and 23 in the northeast portion of the county. We know from the land patents that much of the land patented by John, Elias and Elijah Ballard was in the vicinity of Summerton Creek on the southernmost section of the map, and would have been below District 18. Further, the Elisha Ballard whose Virginia patent landed in North Carolina following the boundary adjustment of 1728 was dead by 1745, according to tax records we have examined. This leads to the conclusion that there was another Elisha Ballard living in northern Nansemond County, whose lineage we have yet to fully appreciate. There is also mention in the Vestry Books of an Abraham Ballard and a John Ballard within the same Districts, but the Vestry Book does not provide sufficient information to make a conclusion regarding their relationship with Elisha Ballard. Abraham was active between 1747 and 1784 (and given the great length of time, they could have been two different people), while John was active between 1752 and 1775, sometimes John and Abraham processioning together. The name Abraham, of course, suggests that these Ballards are related to each other and to the Elisha Ballard and Abraham Ballard that resided in Perquimans County, North Carolina during the first half of the 18th century. Below are excerpts from the Upper Parish Vestry Book. Page numbers precede each entry and refer to the printed version, not the original Vestry Book. 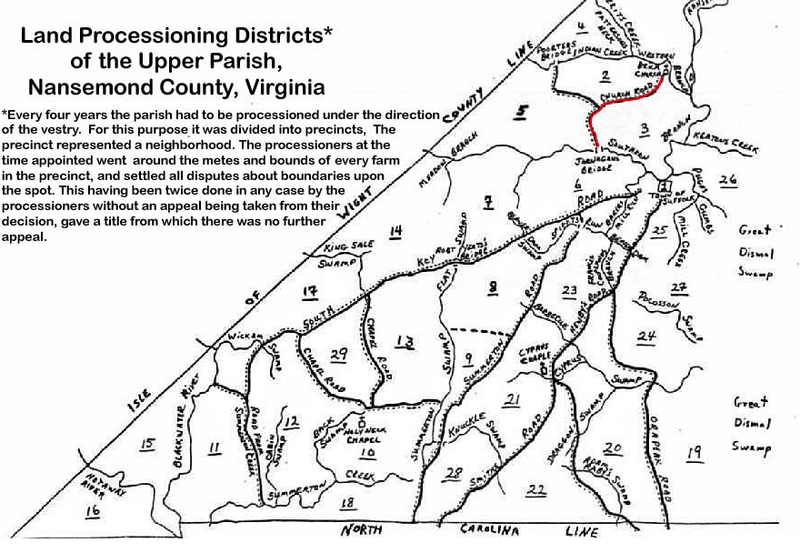 Upper Parish Nansemond County Processioning Boundaries. Map attributed to Bobbie Jones of Suffolk, c. 1970. At a vestry held for the upper parish of Nansemond County (at Suffolk Town) August 31. 1747. Ordered that Abraham Ballard & Elisha Ashbury procession all the Lands in the bounds No. 7 According to Law. At a Vestry held in the Suffolk, for the Upper Parish of Nansemond April 14th 1784. Abram Ballard & John James no. 8.